Fall is here. You wouldn’t know it so much by the weather though since it’s still been hot in the Sacramento area. Seriously, my family has not even used our heater once yet (have you?). But the real estate numbers are a different story because they are showing a very definitive seasonal trend as the Fall market arrived on time over the past 30 or so days. Let’s take a look at 9 quick talking points to help understand and explain how the real estate market is unfolding right now in Sacramento County. I hope this helps. Quoted in the SacBee: By the way, I was quoted in the Sunday morning edition of The Sacramento Bee in a story, “Sacramento area home could set record with 6.5 million listing“. Check it out if you wish. The median price technically declined from $275,000 to $269,951 last month, but take that with a grain of salt since the 2% boost in median price to $275,000 in September felt like more of a statistical fluke than anything. Overall the median price has been about the same for 6 months in a row. Does the median price being the same for 6 months mean prices are stable? Looking at several metrics helps answer this question. Both the average sales price and average price per sq ft took a dip last month. 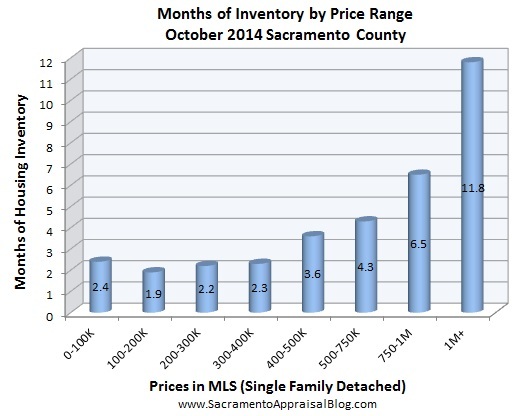 Overall prices are softening in Sacramento County as well as the entire region (more on that in two days). 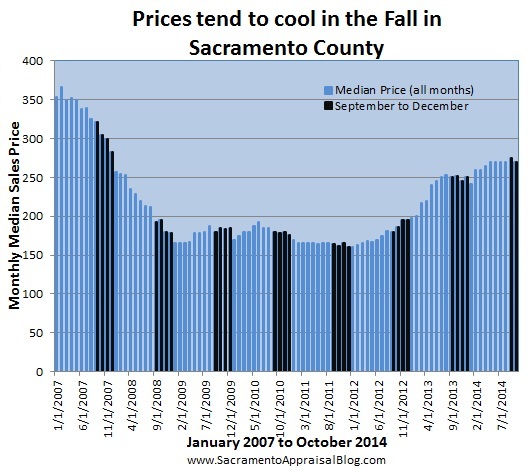 Remember, it’s normal for prices to cool off during the Fall. The market as a whole is is slowing down, which is one thing, but let’s not forget the reality of our seasonal real estate cycle. 3) Inventory is at 2.5 months (about the same as last month). 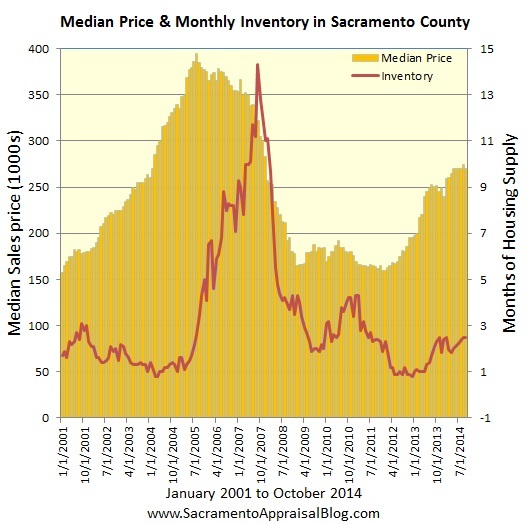 Overall inventory is a hair under 2.5 months of housing supply, which means there are about two-and-a-half months worth of houses for sale right now in Sacramento County. 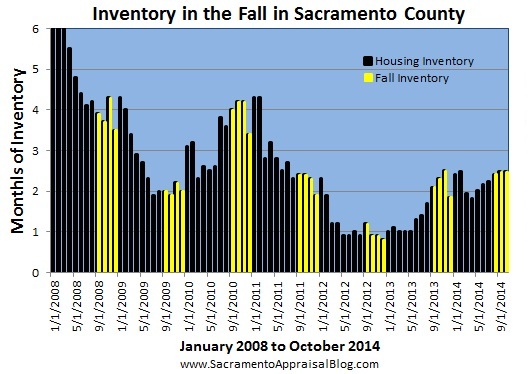 This is about where the peak of inventory was in 2013. If the market unfolds “normally” over the next two months, we should see an increase in inventory. It’s normal to see sales volume decline during the Fall months, so it was not a surprise to see slightly less sales in October compared to September. It is true that volume is actually 4% higher than it was during October 2013. Whiles this is obviously not a huge percentage, it’s still good to see slightly more volume. If you remember, last year was a very dark time in real estate in light of the looming government shutdown and the market having a very strong reaction as cash investors began leaving in droves. Keep in mind some savvy buyers are trying to scoop up properties right now during November and December since they know they are gaining more power to negotiate, but realistically many potential buyers are not shopping aggressively these days since their focus will soon shift to turkeys and holiday gifts. Likewise, some sellers have pulled their listings from the market since they didn’t sell at their desired prices. In fact, beginning several weeks ago price reductions have gone from about 400 per day in MLS to closer to 200. This is a byproduct of a slower Fall season (this is normal). Cash purchases are down by 40% this year, which is really the X-factor for why sales volume has been more sluggish this year. Over the past couple years cash served as a steroid to increase values, but since investors took their foot off the gas pedal, the market has been attempting to figure out how to be normal. What does it look like for real estate to be more driven by local demand instead of an artificial demand from buyers outside of Sacramento? At the same time, cash purchases still represent about 1 in 3 sales under $200,000 (but it’s normal to have more cash at the lower end of the market). Less cash has created more space for both FHA and conventional offers to thrive. This has been great news for buyers. FHA has taken back an additional 4.5% of the market in 2014, which effectively means just over 23% of all sales in 2014 have been FHA (as opposed to 18.9% of all sales last year at this time). Keep in mind almost 33% of all sales used to be FHA a few years ago, so there is definitely room for buyers to absorb even more of the market. Did you catch that stat? As the market unfolds to become more of a buyers’ market in coming time, we can expect to see more FHA, conventional, and VA deals. In short, if you are not familiar with FHA appraisal standards, it’s time to get up to speed. Part of buyers gaining power in Sacramento’s housing market is due to overpriced listings from sellers. While price reductions have slowed down a bit over the past 30 days as less listings are hitting the market, there are still many overpriced properties. Sellers, remember that the mind of the buyer has changed drastically over the past six months. Buyers are simply not pulling the trigger unless properties are well-priced for their condition and location. As I’ve been saying, I recommend pricing according to the most recent competitive listings that are actually getting into contract. The image above shows how many sellers are lagging behind the trend of the market and not quite in tune yet with the change that took place. The market has been very flat and has been softening over time, yet some sellers have tried to “test the market” at higher price levels (which hasn’t worked out too well for many). It took 4 more days to sell a home last month compared to the previous month. When it starts taking longer to sell like this, it’s a sign of the market slowing down (as well as a normal seasonal trend). Remember that it was taking 90 days to sell a home just a few years ago. Generally speaking, the higher the price, the longer it is taking to sell. Take the properties under $100K with a grain of salt since there were fewer sales in that price segment. Remember too that not every price range is experiencing the same trend, which is a powerful point to communicate to your clients. The image above shows how inventory is not the same at every price level. Inventory is still relatively low, and while it’s easier to get into contract than it was in early 2013, it’s still not easy in some price segments. There were only 85 REO sales last month and 79 short sales in the entire county. So is it a good time to be an REO agent or short sale specialist? Both are still relevant avenues of business to a certain extent, but remember to let trends inform what type of business you pursue. Who might your clients be next year if the market continues to shift to a buyers’ market? Many experts thought interest rates would be hovering around 4.5 to 5.0 by the end of 2014, but it doesn’t seem like that’s going to happen. Of course only The Fed knows how things will unfold, but keep watching this trend since lower interest rates can end up pulling in buyers who are sitting on the fence (and thus lowering inventory and creating more pressure on values to increase). Ultimately at some point the real estate market needs to be more driven by the local job market, but for now it looks like a band-aid (temporary solution) of lower interest rates is bound to help fuel the market a bit more. I hope this was helpful. I’d love to hear your take below. Questions: How else would you describe the market? Ryan, your depth of market analysis drives me to go further. Keep up the great work. I would love to do some charts like this in my market, but the MLS only lets me download small samples at a time. An analysis like this of the entire market, rather than just a segment like I usually do, would take me lots of time. I’m thinking of starting my own database with monthly downloads. The data that my MLS publishes for the entire market is really lacking. Thanks so much Gary. It is definitely time-consuming. It’s no small task to crunch the numbers, and it takes hours each month to be honest, so I am very gratified when locals email me to ask for more graphs or use the post to understand the market, explain trends in newsletters, etc…. That makes it all worth it. Too bad your MLS is skimpy on the data. Do you think they know that? Have you ever tried to email them to pitch them an idea on how they might better their services to members? Opening up their data to members would seem to be a very powerful stance so members can be more savvy and compete with the Zillows of the world too. Locals need the opportunity to have the data so they can visually display their expertise. Our MLS has a statistics tab where you can run stats without having to do downloads. That is one way to really work with the information without having to actually export all the information. For instance, I think we can only export 2000 to 4000 chunks of data at one time, but I could run stats on far more properties using the stats tool. Do you guys have anything like that? Great analysis Ryan, I’m sure your graphs are very helpful for locals to understand the market. Thanks Tom. It’s so powerful to see the market visually. 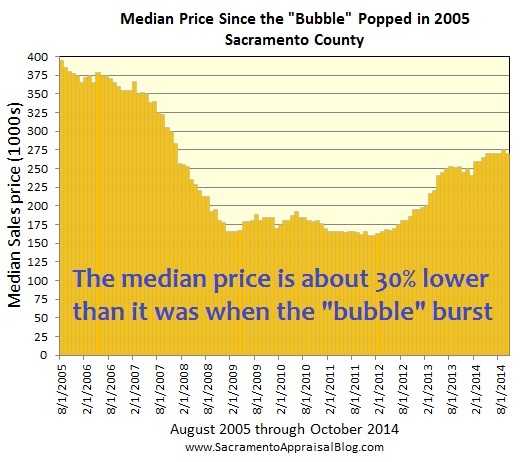 You wrote an eloquent statistical and narrative analysis of the Sacramento residential real estate market. I have read many RE market blogs, and written a few myself. I have never seen one constructed so fine as this one was. Your observations were insightful, your research was thorough and accurate, your graphs were superbly presented and explained. I addressed you as Professor, only partly kidding, as I thought your work on this blog to be of the highest quality. Thanks for the kind words and encouragement, Jim. The use of “professor” makes me smile. Thank you for the high compliment. 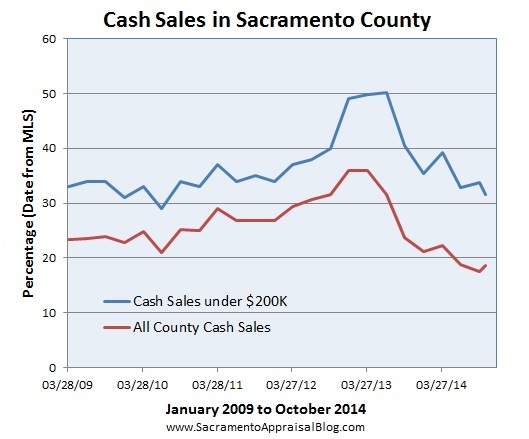 I have two big market posts like this each month (one for Sac County and one for the regional market). I hope you like ones in the future too. Keep me posted with any of your market insight also as I definitely want to hear from any local agents. What we see in the trenches of the market is valuable data.